In 1914, President Woodrow Wilson signed a measure officially establishing the second Sunday in May as Mother’s Day. From historical figures to allegorical representations, images of women are found throughout the U.S. Capitol Building in the art and architecture. While not the only mother in the National Statuary Collection, Sakakawea is likely the most well-known. During the northwest expedition headed by Meriweather Lewis and William Clark, Sakakawea and her husband served as guides and interpreters. The bronze statue, which can be seen in the U.S. Capitol Visitor Center (CVC), features Sakakawea looking westward with her infant son strapped on her back – a son to whom she gave birth while traveling with Lewis and Clark. Many native tribes considered the presence of a woman to mean the expedition was peaceful, likely aiding its success. Working mothers also may draw inspiration from Ester Hobart Morris, credited with helping secure suffrage for women in the Wyoming Territory in 1869. A mother to three boys, Morris also served as the first female Justice of the Peace in the United States. Her bronze statue, given to the collection by Wyoming in 1960, can be seen in the Capitol's Hall of Columns. 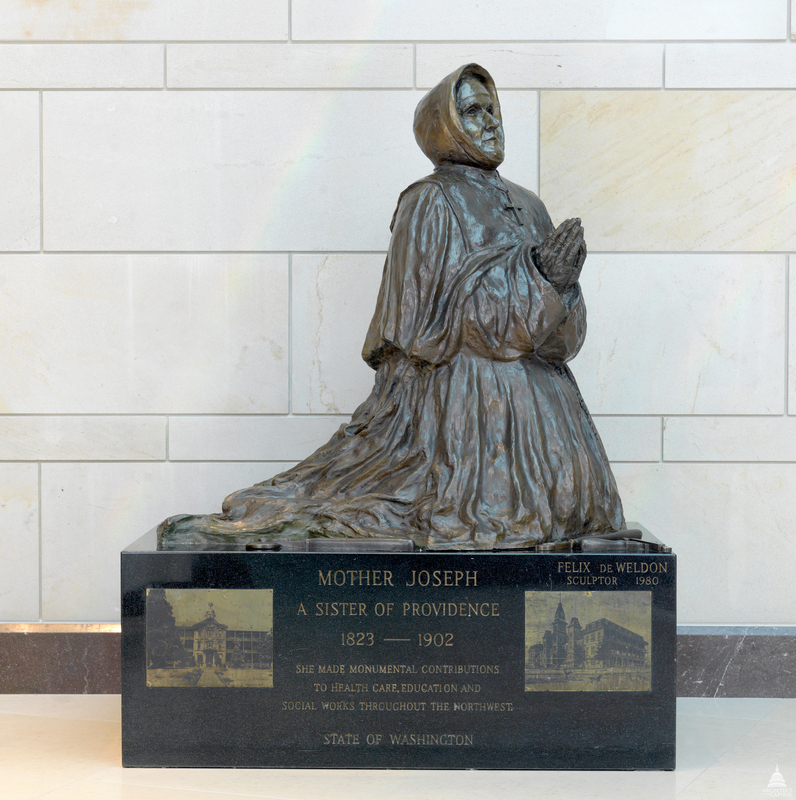 You can find the bronze statue of Mother Joseph Pariseau in the northeast corner of the CVC's Emancipation Hall. A Catholic nun, Mother Joseph cared for many children through the founding of numerous schools, orphanages and community hospitals in what is now Montana, Idaho, Washington and northern Oregon during the 19th century. The sculptor of the statue, Felix de Weldon, is probably best known for the United States Marine Corps War Memorial (Iwo Jima Memorial) located in Arlington, Virginia. In honor of Mother's Day, explore more women who have played significant roles in the development of our nation and are featured in art at the U.S. Capitol. Great article but curious as to why you chose to use the alternative spelling Sakakawea instead of the preferred and more common, Sakagawea. Great question, Jerry! That spelling was chosen since North Dakota, from which the statue was given, has adopted Sakakawea as the most accurate English representation of this name.